I’ve been so out of loop and the circulation and the digital world so its’s been a while since I published anything here, too. But life is good, and is tiring, WHAT IS NEW. In real life, I just said out loud: Ubos na ang pagkatao ko. As in, I purposively retreated away from the world yesterday after a tiring 3-day Digital Congress (#DIGICONXE). This girl (pointing at me) is just all about staring into nothing and just masking it in. 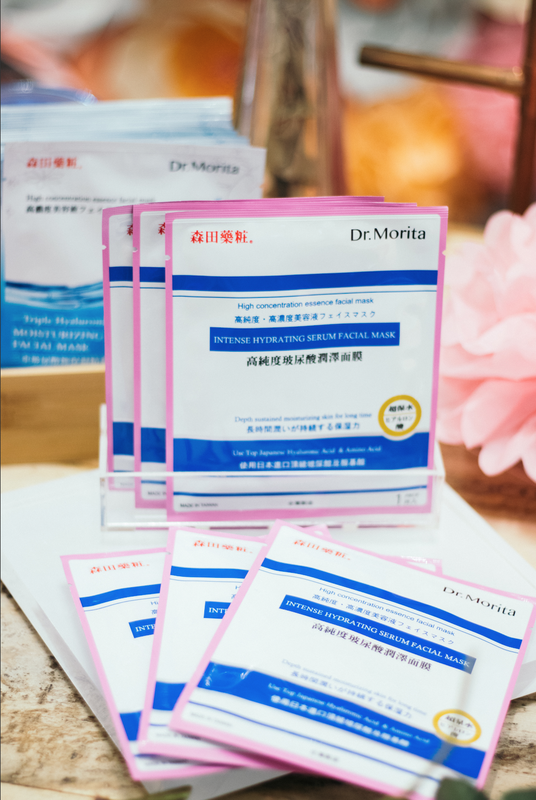 So so excited to talk about Dr. Morita, only the best selling beauty mask from Taiwan. I’ve mentioned it in an earlier post, and it happened before I went to the US so I happily packed Dr. Morita in my luggage and used a couple while in-plane. Dr. Jou, descendant of the original Dr. Morita flew in especially for the launch and it was nice to hear how the Dr. Morita brand has been in the business of hydrating skincare since the 1920s, who’s currently the Chief Brand Consultant. Since the initial launch some months ago, I was able to consult the ladies of Project Vanity, like Denise Bengzon, who is very well versed in skincare and she comes with the recommendation of the Hyaluronic Acid Essence Mask, which ensures lasting moisture is delivered to the skin with Hyaluronic Acid and Collagen imported from Japan. Apart from hydrating the skin with three different sizes of Hyaluronic Acid molecules, it also soothes and promotes skin repair with Cucumber Extract, Marine Collagen, Ceramide, and Niacinamide. This makes a great anti-aging option for all skin types, including those with sensitive skin. Meanwhile, the Dr. Morita Intense Hydrating Serum Facial Mask sustains long-lasting skin moisturization afforded by Japanese Hyaluronic Acid and Amino Acids. Hydration is delivered efficiently to the different layers of the skin thanks to large, medium, and small Hyaluronic Acid molecules. This makes sure even dry skin types get the moisture it needs for a longer time. It also contains skin-caring Niacinamide, Allantoin, Squalane, and Ceramides. Get multiple skin care benefits with Dr. Morita Triple Hyaluronic Acid Moisturizing Essence Facial Mask. Its large, medium, and small Hyaluronic Acid molecules deliver lasting hydration to all layers of the skin. It’s also a great anti-aging and brightening treat for your skin. Among its 11 Amino Acids are Arginine, which brightens skin by repairing visible skin damage, and Glycine and Proline which help smooth fine lines and wrinkles. For the curious kittens, try Dr. Morita Platinum Colloid & Hematite Extraction Whitening Black Facial Mask. Japanese Tranexamic Acid and multiple herb extracts whiten while Hyaluronic Acid gives deep hydration. Treat your skin to Iron-rich Hematite and Obsidian Extracts, known to have toning, regenerating, and strengthening properties. Antioxidant-rich Platinum Colloid helps your skin fight aging. Lastly, give your face a luxury treatment with Dr. Morita Platinum Colloid & Black Pearl Extraction Moisturizing & Whitening Black Facial Mask. Hyaluronic Acid hydrates while Platinum Colloid’s antioxidant content prevents skin from premature aging. Black Pearl Extract has been part of ancient Chinese medicine and skin care for good reason: calcium-rich pearl powder has been known to help detoxify, promote cell renewal, and enhance skin elasticity. Care for your skin while getting whitening benefits from Tranexamic Acid and multiple herb extracts. For PHP74/mask, I can’t really complain. Now available at all Watsons and SM Beauty stores, BTW. ● Cleanse your face. Apply mask on the face and leave it for 10-15 minutes. Remove and gently massage around the face area for the essence to be fully absorbed by the skin. No need to rinse off. ● Dr. Chun Hsu Jou, third generation of the brand’s founding family shares that their sheet masks already have toner, lotion, and serum. Those with dry skin may apply moisturizing serum or cream, if so desired. Hurray for one-step skin care! ● Dr. Jou also recommends using Dr. Morita sheet masks before going to bed for revitalized skin in the morning. ● Don’t let the excess leftover essence in the sheet mask package go to waste. Use it on your face and neck the next morning or night. ● Don’t leave sheet masks on for more than the recommended time, as it will result in “reverse osmosis,” leaving your skin drier than the ideal.